Did you know that? Maybe you actually do know that, but in the mists of providing for everyone else it gets lost. Maybe you believe you matter, but others make you feel like you don’t. Maybe you are told you complain, are selfish, or don’t do enough. Maybe you don’t get a response at all. Whatever is causing you to feel like you don’t matter, you do. Know this. It is true. Lately, I have been reading a lot from other moms about how they can’t do it all. They feel like failures. Question their worth because others seem to have it together. They don’t. I am convinced we are all just faking it and hoping for the best. We can say, why bother it is never enough. My needs don’t matter. My family doesn’t care. These are messages we hear or tell ourselves. They are not true. The thing is, your needs matter. Maybe you haven’t figured out how to say it in a way that you are heard. Maybe your loved ones haven’t learned how to really listen. Whatever it is, know you matter. Don’t listen to the little voice in your heard telling you different. No one gives hugs like you. No one else’s kisses heal like yours. No one worries like you. In all the chaos of motherhood, it is easy to get lost. It is easy to feel unappreciated. You are appreciated even if those around can’t tell you. You matter, moms matter. *This blog post is for informational and educational purposes only. This entry was posted in happiness, parents, self care and tagged #mommy's, #selfcare, children, happiness, mommy self care, moms. A few years ago a friend told me about picking a word for the year or rather a theme instead of doing a New Years resolution. Last year was my first year doing this and I loved it! I picked Intentional and you can read that post. Overall, I think I did well. Everyday I thought about being intentional with what I would do and thought about the person I wanted to be. I wasn’t always who I wanted to be (calm, kind, present), but I did try and continued to give myself grace in the moments it just was not going to happen. Most important to me when picking that word, was being intentional about my time. I wanted to be present with my kids. Last year was overwhelming with being a mom, working and running my own practice. With my word in the back of my head and the support of my husband, I left my job to focus on my therapy practice. I honestly thought I would have more time to blog but that did not happen. I immediately started a health education program. So this extra time I thought I would have, has been used for school work. Leaving little time for this blog. That is not what I want, but if something was going to give, it was had to be this blog. I know that I will eventually get regular at blogging here and hopefully encouraging moms to take time for self-care. Even though I do not blog often, I do post frequently on my facebook page and try to use instagram (Jessica Lynn) so make sure you are following me there. This brings me to my 2016 word for the year. My husband and I talked about this last night. I feel intentional is still very important word for me. What I need to focus on though is what I am doing with my time and following through with my dreams. Not only am I back in school, I am taking another several month online program and have attended a few other training’s. I need to focus my time and be purposeful. But that sounds like intentional. Honestly, I need to “just do it” and follow through with my goals. The thing is, that both my programs will be done (hopefully) by this summer and implementing them into my business will occur around that time. So I decided to go with the word Flourish. This word is not me. I can’t even tell you how much this word is not me. Even typing that word makes me anxious. But, I want my business to grow and I do want it to flourish. If I want that to happen though, I need to work on myself. I need to let go of my fears, be vulnerable and take risks. What is the point of having goals and ways to help people if you keep it to yourself? I have to put myself out there. That is not me. I am the person who likes to one on one conversations and can’t stand crowds. I am the person who will not talk to you if you tell the waiter it is my birthday. I pretty much dislike attention. I know that. But see, with taking the time for self-care and trying to grow spiritually, I am realizing how much more there is in this world and for my own life. Honestly, I love it. I love knowing that my life does not have to be what I thought it was going to be. I do not have to settle. I am learning that I can’t change all my situations and problems, but I can look at them differently, I just need to be open to doing that. The two best ways I have found to do this is through creativity and mindfulness. Both have given me the desire to want to change things, ability to see things differently and it is fun! According to the merriam-webster dictionary the definition of flourish is to grow well: to be healthy. I like that definition. I want to grow. I want to grow as a person emotionally, spirituality, and in my relationships. To flourish you have to invest in yourself. For me, that means focusing on joy, gratitude, presence, releasing fears and being vulnerable. This helps me to focus and hopefully flourish. It sounds nice that way. 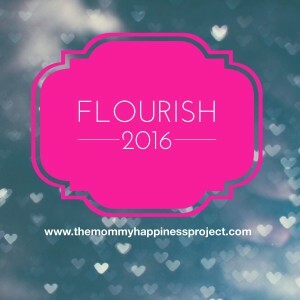 Do you think you are flourishing? What would that look like for you? Full disclosure, I am cheating a little with this word. The MOPS theme this year is fierce flourishing. As a member, I got a bracelete with the word flourish on it. So now, I can wear my bracelet with the reminder that this is my word for the year. Did you pick a 2016 word for the year? If so, I would love to hear it! This entry was posted in happiness, self care. Meditating with my 4-year-old has become one of my most favorite parts of my day. Confession: Meditating does not look like it does in that picture at my house. We are always lying down! It has become a great way to make special time for him and just be. Besides, it is the cutest thing to lay with your son and to have him ask, “wait, which one is my left hand”, in reference to “squeeze your left hand” as spoken from the meditation. 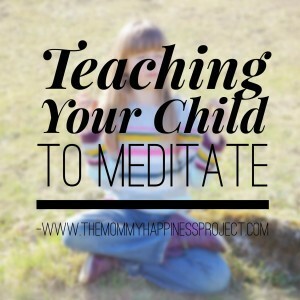 I have learned a few things along the way and thought I would share to help you teach your child to meditate. But let me give you some background. As a therapist, I know the importance of deep diaphragmatic breathing, meditation and practicing mindfulness. I see how these skills work for clients and for myself. It is a coping tool for anxiety, depression, learning to stay calm, dealing with anger, stress management and so much more. I started practicing both mindfulness and meditation much more when I began my own self-care journey. There are a handful of life changes that I have made that have significantly helped me remain sane while in the trenches of raising 2 young active boys. Mindfulness and meditation are two of them. When my son was about 2 or 3, we began working on our deep breathing. You can read about that here and learn how to teach your kids. But let me share this, when you are dealing with temper tantrums, teaching your child to help calm themselves down with your assistance does wonders. Because when they stop screaming, you will learn they really wanted the blue cup and not the red (silly parent, you should have known). Although that is another blog post on dealing with that behavior. Anyways, practicing deep breathing is essential. Just ask Daniel Tiger , Mr. Rogers and Elmo. On my own self-care journey, I began taking time for myself to meditate while my younger son napped and my oldest would have quiet time. I would go in my room and listen to a meditation. Often my older son would come in to see what I was doing and this began his interest in mediating. A body scan is something he would begin doing with me. Most recently, he has asked that I meditate with him at night. There are some children apps for meditating, however we just use the ones I have on my phone. The apps explain what to do for the meditation and it is age appropriate. When he meditates at night, chances are he falls asleep during it. Why I teach my son meditation. Kids already practice mindfulness, meaning being fully present. It is us adults that help them unlearn this skill (hurry up, we are going to be late)! In various ways, I intentionally practice mindfulness everyday with my kids because I can see how I make them push past this skill in our everyday life. I did not love this about me, as I saw it was having an impact. I knew I need to take a step back and really work on leading a less stressful life. As a way to help me be a calmer person, I began to meditate. I think this concept applies to my kids as well. It is a way for us all to be calmer. My main reason for doing it is because my oldest one enjoys it. My younger ones does not like to do it, so I do not make him. Although, as he gets a little older, I hope that he will begin practicing. I know that there are lots of benefits of meditating and I think it is important to help my son learn to listen to his body, feel his emotions and have another outlet to just be. He may not need this skill now, but it will be useful to him in the future, so why not? Model. Start a practice yourself. There are lots of health benefits. I am not where I would like to be in my own meditation practice, but I am doing it daily and feel the positive impact of it. You only really need a few minute to begin. Practice deep breathing with your kids. Here is a link of a previous post about teaching it. Schedule a time to do it. Start your day that way or end it with a meditation. I am a huge fan of apps on your phones for practicing a meditation. However, if you do not have a smart phone, you can buy a CD or even just go to youtube. Don’t want to buy one, try focusing on your breathe in silence. Try different meditations. Your child may like different ones as well. My oldest has figured out he likes ones that “tell you what to do, with rain in the background”. This meditation is one to do with kids from the Greater Good at Berkley. 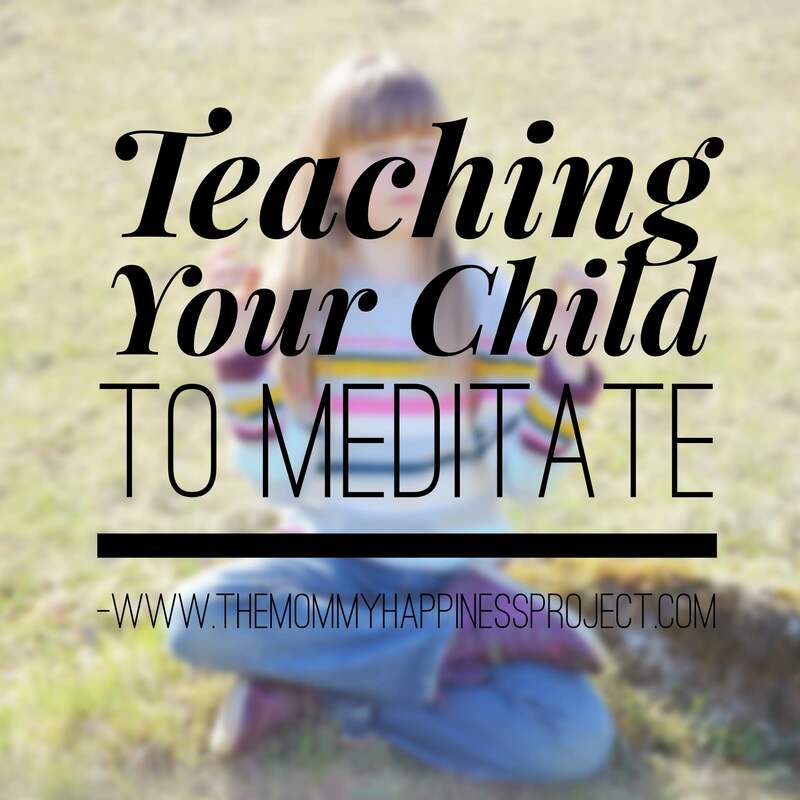 You can find more information on meditating with kids here and here. This post is for informational and educational purposes only. This entry was posted in happiness, kids, self care and tagged #intentional living, happiness, meditating, self care. It has been awhile since I have written a blog post, mostly because I am making big changes. Big life changes. Changes needed to happen because I was working too much, for me anyways. When I had my first child, I went back to work full-time. About a month later I went down to part-time. I couldn’t do it. I was struggling in my new role as mom and working was just too much for me. I created a good balance for many years working part-time. At the end of my mommy happiness challenge last year, I shared that I decided to open my own practice (I am a mental health therapist). Over the past year, I have been working hard to open and run this practice, all while still trying to focus on my family and not lose to much time with them. I would love to be able to say that I am leaving my current job because my practice is full and things are great. That is not the case, but I am on my way I would like to think. The reality is that my kids will be in school every morning come the fall, and I work nights between my practice and my current job. As a family, we made a decision that something would need to change, as I could not continue to work nights and sacrifice almost 2 or more whole days without seeing my kids. That would not work for my family. So, we made a decision that I would leave my job. Although it is hard to leave a place that I love and a consistent paycheck, I have a sense of peace. I know I am doing what is right for myself and my family. I am the happiest I have been in a long time. 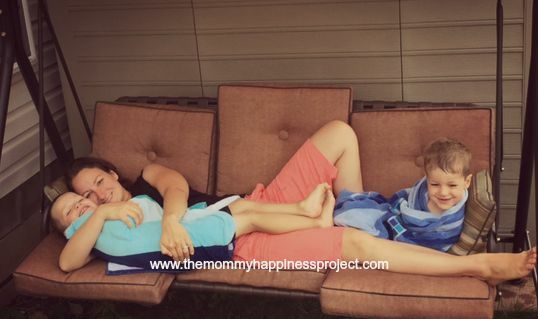 I know that I call this blog the mommy happiness project, but it is really about looking for the joy and finding happiness in everyday moments, despite the chaos of motherhood. It is not always about happiness. Parts of motherhood are difficult. Frankly, being an adult is really hard. Making a decision to not have a consistent paycheck is SCARY. But what matters more to me? First is my sanity and then being a present and calm mother to my kids. If I am stressed all the time, I can’t do that. No one can. So in a time in my life that I should actually be stressed and scared, I am not. This reinforces that I am making the best decision. I know I have work to do around building my practice and spending less money (no more Target trips), but I am okay with that. I really have no idea what will happen in the future, but I am okay with that too. Why am I sharing this with you? Mostly to provide a sense of hope. Things can get better. If I never took the time for self-care, I would not be here. I often share with clients that when we are stressed, we get stuck in tunnel vision. We only see one way out. But when we de-stress and remain calm, we can see things differently, are more open to possibilities and willing to try something new. I think that is where I am at. I see the possibility of having a different life than I have ever imaged before. This life is about the journey and I am ready for the ride. For the rest of the summer, you will most likely find me at the beach! If I am not there, I will be in my backyard with my boys or hiking. And since I won’t be working as much, I will hopefully be writing more. So stay tuned for your own self-care encouragement moms. You need it and are worth it. Oh, and I should give a special shout out to my husband. He is my biggest supporter. Best of all, he believes in me. I couldn’t ask for any better! I know I am not the only mom out there who has decided to stay at home despite fear. I know I am not the only mom who is trying to build and run their own business. All you amazing mamas out there, what do you do to help yourself? What special tricks do you have? At the end of the day, this is what I know. Us moms, we are all alike. We just want the best for our kids and our family’s. We do the best we can. This entry was posted in happiness, self care and tagged #happinesschallenge, #intentional living, mommy, mommy self care, self care. The car ride home from the hospital after having my first child I cried the whole way. Not out of joy, but out of fear. I honestly couldn’t believe that they let me leave. What did I know about caring for a baby. I had never cared for a baby. Maybe you didn’t cry on the way home, but I know I am not alone in having felt overwhelmed when first becoming a new parent. There is so much that is new. I just wanted to be a good mom. Things that seem simple such as eating and sleeping can become real stressful events for parents. If you are anything like me, chances are that you talked to someone, read a book about babies or at least googled a few things in those early months of having a baby. As parents, we work really hard to provide the best care for our babies and kids. Parents want the best for their children. They recognize the importance of ensuring that they are healthy and most just want them to be happy kids. Parents work really hard to make certain that their child’s needs are being met. When a baby or toddler is upset, often parents first go to the “basics”- is the baby tired, hungry, need a diaper change or just need some cuddle time. Doing this, we start to establish habits and structure for our kids. 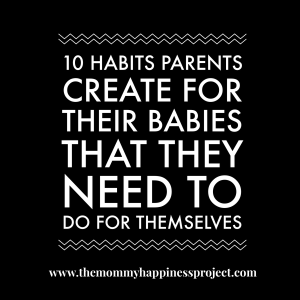 Something happens over time though because these great habits that we have started for our kids slip away, part due to parents not enforcing them, part do to just life and part due to kids not taking ownership and doing the habits themselves as they age. By adulthood, many adults have lost some, if not all these amazing habits that our own parents worked hard to give us as infants. Many of these same habits are ones that can make our life a lot better today. 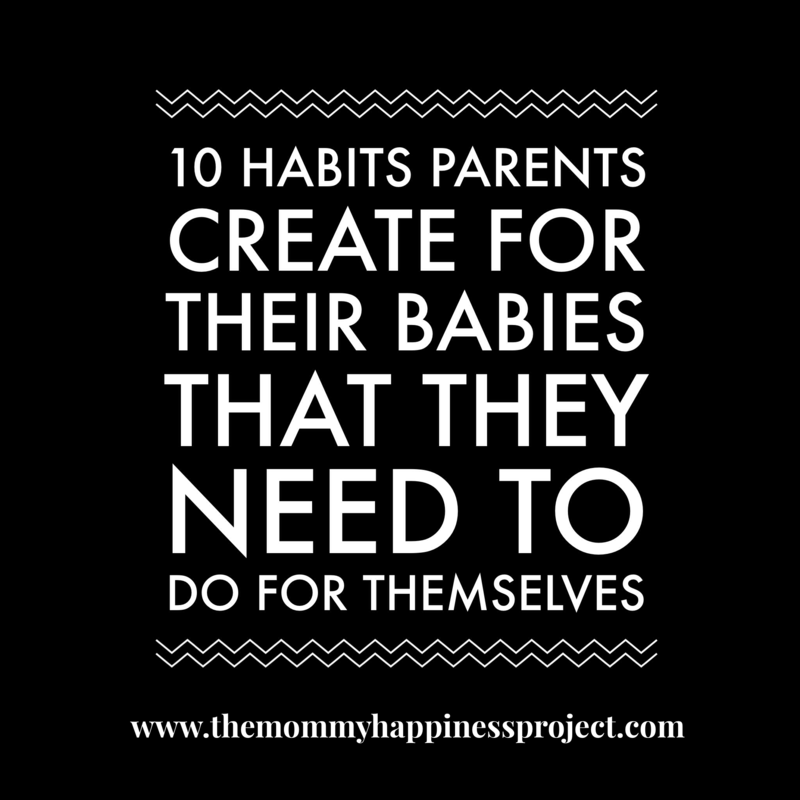 Here are 10 habits we establish for our kids that we need to do for ourselves. 1.Sleep routine. Many parents have developed a routine for bedtime as it has shown to help with transitioning babies and kids to bed. Maybe this routine begins with a bath, feeding if they are an infant, a book, prayers or cuddle time. Young children do well when they are put down at the same time each night. This all promotes better sleep. This same idea applies to adults too. This isn’t just for those struggling with sleeping issues such as insomnia. Having a routine can help promote better sleep. Going to bed at the same time each night is great for sleep. Other suggestions include turning electronics off at least an hour before bed, and then do your normal routine (brush teeth etc). Maybe try something relaxing such as some stretching, a meditation, gratitude list or deep breathing. 2. Healthy foods. When parents begin to feed their infants baby food, these are always healthy foods such as squash, sweet potatoes, carrots, peas and avocados. When kids get a bit older, maybe not all their foods are healthy, but most parents still try to get their kids to eat healthy foods and worry that they are getting their vegetables. But do you worry about yours? Do you get all your own needed vegetables and other healthy foods? Eating sugary and fried foods all day will leave you feeling sluggish, possibly irritable and may affect your overall mood. We know this, that is why we feed young kids healthy foods. Why change this for yourself? 3.Physical activity. We want our kids to play. Getting out all that energy is a must! Tickle fests? Yes! Dance parties? Yes! Tag? Yes! Adults need that too and depending on how active you are, you may need more than what your are doing with your kids. Making time for your own physical activity keeps parents healthy too. It is okay to take time away from your kids to go running or go to the gym. If you are not able to arrange childcare, bring kids along on a walk or try to get some physical activity done while they are playing or watching a show. They will learn that this is mommy/daddy workout time. 4. Medical care. Our medical system is set up to provide preventive care for our kids. They have routine visits frequently during the first year and then yearly. Although it isn’t easy, parents often can make arrangements when a child is sick to stay home or take them to the doctors, often having to miss work. But what about you? Are you the type of person who has to be very sick before you go to the doctors or call in? Have you ever put off your own medical care, tried wait it out because you didn’t have time? When is the last time you had a physical? Taking care of your own medical care is really important. 5. Being Polite. Parents work hard to teach their kids manners. Saying thank you or saying please is something that parents are mindful of to model and teach children. I know I work hard to teach my kids to be polite. But did you ever notice, that us adults are not always so kind? I am not talking about just to strangers, but what about people in your own home? Do you express gratitude to them for things they have done? Say things like thank you or request something in a kind voice? Being kind can go along way. 6. Positive self-talk and encouragement: Teaching kids to be kind to their self is important. Encouraging them to try again, that mistakes are okay and that they are worthy is part of our jobs as parents. But what about you? Do you struggle with negative self-talk? Do you think negatively about your parenting? Say negative comments to yourself about your weight, compare yourself to others or get down on yourself about something you did? What if instead, you encouraged yourself and lifted yourself up, like you do for your kids? Say kind things to yourself. Being kind to our own self is important for overall wellness, self-worth and self-esteem. Everyone is important. 7. Slow down. After a long day at a party and everyone holding the new baby can be overwhelming for that little guy. That infant needs cuddle time with mom or dad. After a busy weekend of errands and play dates, kids need a night of relaxing and connecting with parents before Monday rolls around. This is no different for parents. Families in particular have moved toward a trend of jam packing time with various activities. Although there is a variety of reasons why this is, the reality is that slowing down can be beneficial for everyone. Taking time to just hang out as a family and truly connect can do wonders for families and for self. 8. Reading/writing. We know that reading to infants and toddlers is important and is essential as kids grow. Kids are encouraged to write at school and sometimes at home. Writing is a way for kids to express themselves and be creative. This does not change as we get older. Reading for pleasure is a great form of self-care. Reading to learn about something new is exciting. Even for adults, writing continues to allow us to express ourselves, process feelings and heal. Even if it is a one sentence for something you are grateful for or writing for 5 minutes to just express feelings, any form of writing can be healthy. 9. Less screen time. Parents know that less is best when it comes to screen time. This means a lot more today then when I was a kid. Today it is a combination of television, computers and tablets. Screen time takes away time to connect with family and friends. It provides less time to be outside enjoying nature and sunshine, some of the best things for us. This is no different for adults. It keeps us from connecting with our loved ones and enjoying the natural beauty of the world. 10. Making time for friendships. If children are not in daycare, parents can worry about socialization for their kids. This can mean stepping out of their comfort zone and joining a moms group, talking to a mom at the playground or being brave and asking a mom to meet up for a play date. Parents are willing to do this for their kids. Even though moms and dads benefit from play dates because they can connect with another parent, having relationships outside of your children is important. People can put off meeting up with friends because of new responsibilities, just being tired or overwhelmed. Although at times it can seem like a lot to go out with friends, remember that it is healthy to connect with others. Connect over your kids, but connect over other interests as well. This also applies to your significant others as well! What do you do on this list and what do you not do? Taking time for these can really help with overall stress. Remember, you are setting this great habits up for your kids because they are what is best for them. You deserve the same. You are worth it and need it too. Interested in more ideas for self-care? Read my post on self-care in 5 minutes or less. This information is for educational and informational purposes only. If you are in need of therapy, please contact a local therapist. This entry was posted in happiness, kids, self care and tagged #intentional living, #mommy's, mommy, mommy self care. How is your happiness challenge been going? Have you made time for yourself? Are you still struggling with mom stress? What have you done to “refill” your own pitcher so that you can continue to give to others? Well, if you haven’t found time or ways to take care of yourself, Julie from www.juliesafranski.com has some great suggestions for managing the stress that moms experience. In her blog post How Moms Can Take Charge of Their Stress: 9 Simple Self Care Strategies to Try some of her suggestions include learning to say no, asking for help and socializing. What would you add to this list? We would love to hear what you do for you own self-care. This entry was posted in happiness, self care and tagged #happinesschallenge, 30 day challenge, happiness, self care. I often talk about slowing down and it has even been one of the happiness challenges this month. But the reality is that somethings need to get done. I have learned to let go of a lot of things, but for the things that you can’t, learning to multi-task is a great way to get more done. For example, I almost always post around 7:30am. Why? Because I am brushing my teeth and posting something on Facebook. Today JoDee from A to Z Moms Like Me has some great tips in her blog post How To Be A Multi-Tasking Master. JoDee is mom of 6 kids. She loves learning and is always full of ideas that keep her busy doing new projects all the time. Besides being a mom, wife and blogger, she is the author of a number of books on Amazon (mostly simple-yet loved children’s books) and a public speaker. She has developed a school program called “Raising Superheroes” that helps students discover the hero within while guiding teachers and parents how to guide them. JoDee has a ton going out, so make sure you check out all she is doing here. JoDee shared with me that her favorite thing to do for self-care is probably a nice hot bath and a meditation- her favorite meditation is called “The Daisy Pond”. She shared that being an extrovert she tends to re energize by having fun with friends so girls nights are always fun too. To learn JoDee’s ways to be a multi-tasking master make sure you read her post here. What areas are you good at being a multi-tasker? This entry was posted in happiness, self care and tagged #happinesschallenge, #intentional living, 30 day challenge, mommy, mommy self care. I have recently connected with Kimberly over at my toddler talks. Kimberly is a licensed speech pathologist, mother and author of My Toddler Talks and Learning to Read is a Ball. In her post, Toddler Language Delays: 5 Ways to Stay Hopeful When You Want to See Change Now, Kimberly share some great advice. Her advice includes some of following: (1) Remember a starting point to refer back to when needed (2) Set achievable goals one for your child and for you (3) chart progress (4) Consult with a professional and (5) Take the Good with the Bad. Kimberly also shared the importance of talking about your feeling and doing something for yourself. I love the idea of talking about hope as I often talk about it with people. On my Facebook page, I will give HOPE as a prompt work for a 5 minute writing exercise. Having hope is essential. Much of Kimberly’s advice can apply to anyone I believe, especially if you are trying to mark progress with a child on any behavior. Kimberly shared with me that her favorite thing for self-care is ensuring that she get 7 to 8 hours of sleep each night. As you could imagine, it doesn’t always happen, so if she can’t sleep she tries to embrace a calm, peaceful mind by breathing and burning her lavender Woodwick candle. Kimberly stated that it smells wonderful and sounds like a fireplace when it burns. Now that sounds nice! Make sure you check out Kimberly’s post Toddler Language Delays: 5 Ways to Stay Hopeful When You Want to See Change Now. This entry was posted in happiness, Mommy blog, self care and tagged #happinesschallenge, 30 day challenge, mommy self care. All moms need support at any stage, but especially during the the first few weeks if not months of becoming a mom. To receive support, one must ask for help and for many this may be a struggle. However, it can really help your overall well-being to ask for help, connect with other moms and share your feelings with your own partner. For today’s post, I have connect with Jill Cedar who is the childcare Expert for About.com. Jill Ceder is a writer and psychotherapist working with women, children and families. She loves working with parents, helping them navigate their roles, balance their busy lives, and find strategies that work for their family. She is the Childcare Expert for About.com, a 30 Second Mom Contributor and a Momco Brand Ambassador. Her favorite activity is hanging out with her almost 2 year old son. Jill shared with me that her favorite forms of self-care are a quick massage if she was to splurge. But also going to Target early in the morning when its empty, a guilty pleasure of hers (and lets face it, probably every other woman out there, right?). Jill is letting me share one of her articles that she wrote for Postpartum Support International Blog Hop. Her article 6 ways new moms can get support has a lot of useful tips. I would love to know what you would add to this list. Thank you so much Jill. This entry was posted in happiness, self care and tagged happiness, self care. 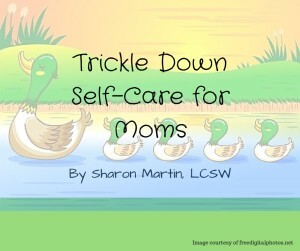 Today’s guest post is by Sharon Martin, LCSW. She is a private practice clinician in San Jose California. She focuses on “helping adults and teens manage stress in order to build peace, balance, and grow happiness in their lives”. Sharon shared with me that one of her favorite forms of self-care is a long walk with one of her girlfriends. How nice does that sound! Do you wish your morning was a quiet retreat of sipping coffee while reading a novel or meditation followed by a green smoothie? Instead does is look more like a crazed woman rushing around, herding kids, packing lunches, searching for lost homework? Moms are the ultimate caretakers. For me, there is nothing as comforting as my mom when I’m sick or hurting. Now, as a mother myself, I realize just how labor intensive parenting is. Sometimes, we are so busy taking care of everyone else’s needs that we neglect ourselves. And, as you know, motherhood is more than a full-time job. There is no real time off unless we make it. What happens when you don’t take care of your own needs? I know I get tired, cranky, resentful and burned out. We need to challenge our thoughts that self-care is selfish or a luxury. Self-care is a necessity. If we are going to practice self-care, we first have to see it as valid – as important for ourselves and our families. I have found that the time I put into self-care not only benefits me, but also my husband and three kids. I call this “trickle down self-care”. 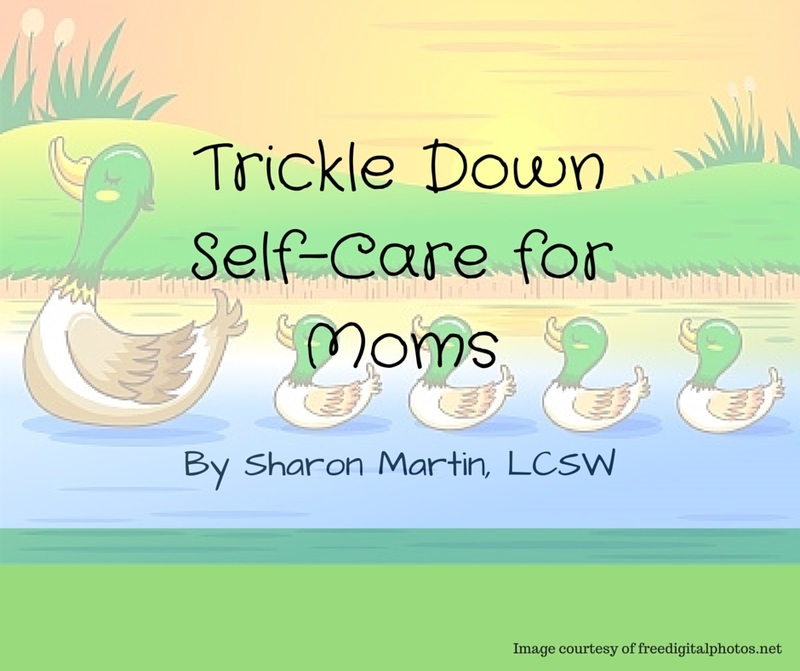 The positive results of your self-care will trickle down to your kids and family. Let’s say you take an hour to go to the gym. Yes, this is an hour away from your kids and long to-do list. Probably no one will argue that your physical health is important and will benefit from a workout at the gym. But also remember that if you return home from the gym with endorphins flowing, more energy, and a renewed spirit, your family will immediately experience the benefits as well. In his book, The Happiness Advantage, Shawn Achor explains the scientific research showing that engaging in social activities, hobbies, and rest actually makes us more productive, happy, and energetic. This is exactly why regular self-care helps me to be a better mother. I hope that you will put a variety of self-care activities on your calendar. They will not only benefit you, but the effects will trickle down and benefit your family too. Sharon Martin, a San Francisco Bay Area therapist, specializes in helping you decrease stress and anxiety in order to create a peaceful and balanced life. Sharon helps adults and teenagers heal, succeed, and grow happiness through her counseling services. She has had a private psychotherapy practice in San Jose for the past 15 years where she is available for counseling and clinical supervision. What do you think, do you agree with this idea of self-care trickling down to your family? I know I do. I say it all the time. Taking time for self-care only makes me a better mom because I am calmer and more present. This entry was posted in happiness, Mommy blog and tagged #happinesschallenge, #intentional living, 30 day challenge, mommy self care. Stay connected with new blog post to encourage your own self-care.